Adam Pedley is a father of 2 boys and is in the business of helping others. One of the support groups he runs with his wife is Home Birth My Birth. Well, I didn’t choose homebirth, my wife did. My wife had an unpleasant experience in hospital and didn’t want to go back there again. It was my wife’s idea. My first reaction was a look of confusion. For me I only knew that babies were born in hospital and I didn’t even think you were allowed to give birth at home. After my wife gave me more information on home birth I became a little more open to the idea. I don’t think I actually had a choice, so I had to agree.
. He was the man who pioneered water birth in western society. The main fear of a homebirth was what if something went wrong. It seems to be a common theme that runs through anyone first introduced to home birthing. The main thing that got me through those fears was learning that the midwife was medically trained and if an emergency did occur, even though highly unlikely, we would just go to the hospital. I think I was told everything before the homebirth so I was quite relaxed during the whole birth. For first time homebirth dads I would say that homebirths are natural and the way it has been done for most generations before us whereas hospital births are relatively new. If there is a problem (and that would be very rare) it’s only a short trip to hospital. Also complications during birth don’t happen within minutes, any warning signs are there well in advance, normally before labor starts. There are so many advantages for everyone with a homebirth I wouldn’t have enough time to list them. I actually found it very easy. My wife always laughs when I say to others that the birth was very easy. I think I was just running on adrenalin during the birth as it occurred early morning yet I felt exhilarated. All of my guy friends were either single or had no children. Many found it astounding that my wife was going to give birth at home in water and they generally just displayed fear at the concept. The midwife was great during the birth. She left my wife to birth how she wanted and just checked up on a few things during the labor. It was great just having someone there making sure everything is ok and reassuring my wife if needed. Our relationship has stayed the same, though we were a lot more relaxed and closer after the birth, than after the birth in hospital. I wouldn’t do it any other way now. 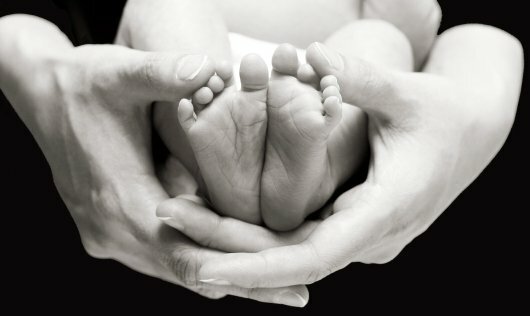 It was such a peaceful birth, both the baby and mother were happy and relaxed and so was I. I remember when he was born. He came out, arms wide open and looking up at us as he floated in the birth pool. It was an amazing experience. It was an exciting and joyous moment when my son entered the world. Having a water birth at home was very relaxing and it was great to be having a birth the way my wife wanted. I was very proud of my wife. Homebirth Toolkit: A comprehensive guide for expectant families who are planning or considering the option of home birth.